The Galco Tuck-N-Go is a deep concealment inside-the-pants holster designed to build on the success of their Stow-N-Go. It is made from premium center cut black steerhide for comfort and durability, and fits semi-automatic pistols and double-action revolvers. 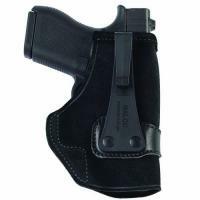 It features the patented Generation III tuckable J-Hook, which minimizes visibility so that your holster can be concealed by just a tucked-in shirt. It hooks over the top of the pants and behind the belt, and fits belts up to 1.5 inches wide. The holster provides a perfectly vertical orientation and its open top ensures that there is nothing to obstruct your draw, allowing you to react quickly to emerging threats. Works perfectly on my Sig P238. A little diferent than ehat i am used to but very nice. Excellent holster. Great service from CopsPlus. At first was very disappointed since the weight of my Glock 23 would drag my pants enough to be noticed. then Eureka I had one inch wide flat webbing left over from climbing days. Put a fastex buckle on webbing and wear that around my waist. Hang the holster on the webbing and now a four star rig. if only adjustable cant sigh. Otherwise good product. BTW my clip is metal and it works well. I suspect a smaller weapon such as Glock 43 would be great. It's workable and a great price. Another fine holster. I tend to wear other ones more but I have no complaints with this one. My 442 works great with this holster Has a fast draw and it is simple. Is there leather between skin and top of gun (hammer and grip area)? The leather will be the same height as the clip side. It will not reach the top of the gun.